Storage account in Azure is a modern data storage place where we store data and files. 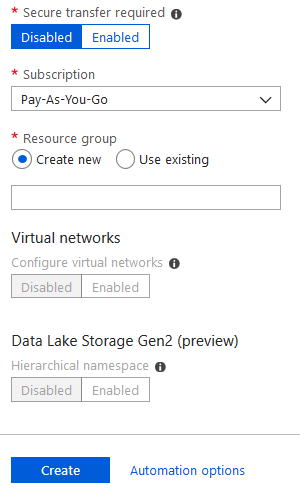 In this blog, we will see what are storage services available in Azure and How to create an Azure Storage account? Azure storage provides huge scalable storage for data objects as well as for file system. Create a storage account to store up to 500TB of data in the cloud. Use a general-purpose storage account to store object data, use a NoSQL data store, define and use queues for message processing, and set up file shares in the cloud. Use the Blob storage account and the hot or cool access tiers to optimize your costs based on how frequently your object data is accessed. 1. Azure Blob - Storage for text and binary data. 3. Azure Queue - Messaging storage for reliable messaging between 2 components. 4. Azure Tables - Storage for NoSQL type data i.e. schemaless storage. 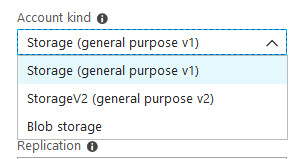 How to create Storage Account in Azure Portal? 3. From left side menu click Storage accounts. Here you may see all your storage accounts created by you. In my case, I have not created any storage account in this dashboard. 4. If you want to create a new Storage account, click on Add. A new form will appear. Let's see the field and validations one by one. This field can contain only lowercase letters and numbers. A name must be between 3 and 24 characters. This will be Resource Manager. Click here to know more about Azure Resource Manager (ARM) model. Blob storage account - Blob is a specialized storage account for storing your unstructured data as blobs (objects) in Azure Storage. Blob storage accounts are similar to your existing general-purpose storage accounts and share all the great durability, availability, scalability, and performance feature that you use today including 100% API consistency for block blobs and append blobs. To store images, application files etc then you should go for general purpose storage. If you are looking for highly optimized storage then choose Blob Storage. Select your preferred storage location. The data in your Microsoft Azure storage account is always replicated to ensure durability and high availability. Azure Storage replication copies your data so that it is protected from planned and unplanned events ranging from transient hardware failures, network or power outages, massive natural disasters, and so on. Locally redundant storage (LRS) - LRS is designed to provide at least 99.999999999% (11 9's) durability of objects over a given year by replicating your data within a storage scale unit. A storage scale unit is hosted in a data center in the region in which you created your storage account. Geo-redundant storage (GRS) - It is designed to provide at least 99.99999999999999% (16 9's) durability of objects over a given year by replicating your data to a secondary region that is hundreds of miles away from the primary region. If your storage account has GRS enabled, then your data is durable even in the case of a complete regional outage or a disaster in which the primary region is not recoverable. 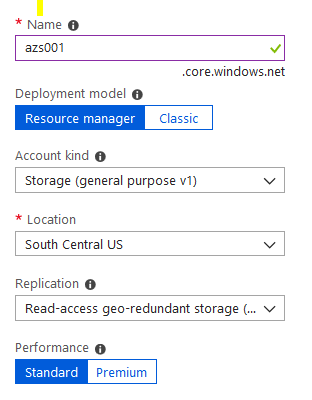 Read-access geo-redundant storage (RA-GRS) - It maximizes availability for your storage account. RA-GRS provides read-only access to the data in the secondary location, in addition to geo-replication across two regions. Either you can choose standard or premium. What are the differences between standard and premium? Standard storage accounts are backed by magnetic drives and provide the lowest cost per GB. They're best for applications that require bulk storage or where data is accessed infrequently. Premium storage accounts are backed by solid state drives and offer consistent, low-latency performance. They can only be used with Azure virtual machine disks, and are best for I/O-intensive applications, like databases. Additionally, virtual machines that use Premium storage for all disks qualify for a 99.9% SLA, even when running outside of an availability set. This setting can't be changed after the storage account is created. Select Disabled or Enabled -The secure transfer option enhances the security of your storage account by only allowing requests to the storage account by a secure connection. For example, when calling REST APIs to access your storage accounts, you must connect using HTTPs. Any requests using HTTP will be rejected when 'secure transfer required' is enabled. When you are using the Azure files service, connection without encryption will fail, including scenarios using SMB 2.1, SMB 3.0 without encryption, and some flavors of the Linux SMB client. Because Azure storage doesn’t support HTTPs for custom domain names, this option is not applied when using a custom domain name. Select your subscription from the dropdown list. Either select an existing Resource group or create a new resource group. Azure Data Lake Storage Gen2 accelerates big data analytics workloads and enhances shared data lake security with file-level permissions. In my case Virtual Networks and Data Lake Storage not supported due to subscription and location. 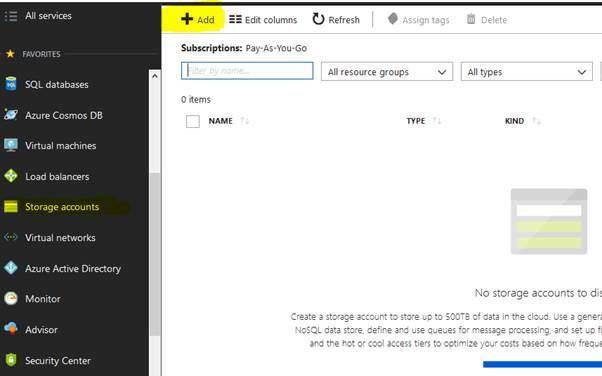 Click on Create and get a new Azure Storage Account.